Keith Alexander appeared live by Skype link-up from his home in Australia. He recalled Roy Thinnes on Doppelganger as being one of the more affable and co-operative American stars and revealed that his only souvenir of UFO was the white SHADO socks he had worn throughout production. The idea of Skype interviews might set something of a precedent for Conventions – why schlep actors halfway across the country when you can talk to them from their spare bedroom? Makes it a bit harder to get an autograph but I guess it's better than nothing! I recall going to a Fanderson convention 17 years ago, and some of the most memorable parts were being within a few feet of Gabrielle Drake, Ed Bishop, Gerry Anderson, etc. 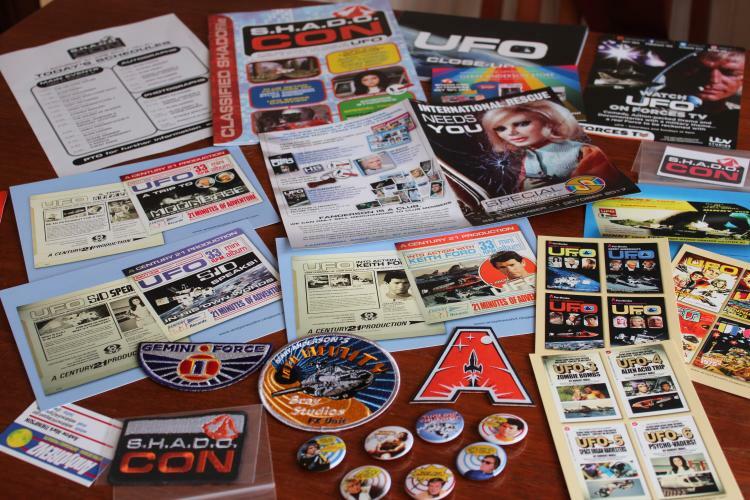 Contents of S.H.A.D.O.CON 'goody bag'. All excellent. Particularly LOVE photos of the 'spoof' merchandise - UFO annuals, paperbacks, badges and records. Very imaginative and very well done. If I didn't know better, I'd swear these were REAL. All in all... F.A.B.